The successful participants pose with their certificates. 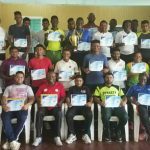 The Ancient County of Berbice would now benefit from the services of Pre Level One Coaches, who on Saturday last successfully completed the Berbice Cricket Board organised Brian Ramphal Coaching Programme. The Brian Ramphal Coaching Programme started last with 45 potential coaches and ended with 40 of them receiving their Berbice Cricket Board Certificate of Participation. President of the Berbice Cricket Board Hilbert Foster at the Closing Ceremony congratulated the forty Pre Level One Coaches for successfully completing the programme and expressed confidence that the county would benefit greatly from the investment made by the Berbice Cricket Board and Brian Ramphal. The Berbice Cricket Board, Foster stated would be investing heavily into training of new coaches, youth cricketers and alsoBest Participant Philbert Wilburgh received his Award from Winston Smith. Ramphal in April 2018, donated $1M to the Berbice Cricket Board Cricket Developmental Programme which is being used for a series of programmes including Educational Posters, Annual Magazine, Award Ceremony, the Coaching Seminar and a Double wicket Competition for First Division Teams.